Facebook has finally launched an app that does not only aim to increase its membership! Named Paper, it is an app that is something completely new and is not just focused on your Facebook life. In fact, on opening the app for the first time you would will have doubts if this app is actually a Facebook product. With Facebook reaching its 10 years, its investors and financial pundits are seriously doubting its long term viability. Facebook is no longer a cool product which is attracting the young crowd towards it. WhatsApp and Instagram are primary examples that the young flock of Facebook which forms its most active group of users, has many other options to go to and they are already adopting these new services. Paper is the product of Creative Labs within Facebook which is a group of small teams within Facebook that thinks about new ideas, implements them and sees if they stick. One main developer behind Paper is Matas who also designed the original iPhone interface and has many other achievements in interface development in his portfolio. Matas had joined Facebook in 2011 when his company Push Pop Press was acquired by FB. Although Matas was initially tasked with designing Paper as a personal newsletter as has always been Zuckerberg's dream but it turned out to be a lot more and better than that. It has divided the news based on quite narrow categories. One is your old News Feed but there are other 20 that are based on categories like Sports, Tech, Headlines, Cute, Planet and so on. Paper has not been left just on the efficiency of any algorithm and is rather curated by humans to make sure that you screen is not filled by some ridiculous article on Loosing Weight. What the app presently has is a host of respectable articles from reputable sources. For instance the present source of the "Headlines" feed on Paper is populated from the profile pages of the reputed newspapers of the U.S. like The New York Times, Times and NPR. One thing you might find a little discomforting while using this app initially is that the scrolling is horizontal rather than vertical that we have grown used to now courtesy Facebook. The stories curated on your screen are not necessarily on a particular topic, rather these are those stories that have had high level of engagement from the followers of these pages. You also have the flexibility to serialize your tiles in a way that your personal selected category comes first. If you would prefer to shift "lol" category to the end of the category list then all it takes is a tap and a swipe. Paper has been designed in a way to make curate your online life in one app. The pages you regularly browse, the famous online magazines you regularly like to read... Facebook has tried to bring all those under one ecosystem. How Paper does this is by using custom fonts and colors that match the actual magazines and blogs of these online publishers. For instance you will find the National Geographic tile to have the same golden border as its online magazine. This way you feel familiar and hence comfortable in this new environment giving you less reason to leave the app. Each card of Paper has the same look- a profile photo at the top followed by some text and then cards linked to it representing the recent articles from that source. Facebook has made an intelligent decision in accepting and adopting the thinking that a persons life is not limited to his/her friend's post. Reading the views of others, interacting with the whole world is a part that cannot be ignored in a social ecosystem. "Content comes first" is the exact name of the ideology that Facebook has finally adopted and is the way many of the new growing social services are also following like Twitter. Paper comes as a complete news app which combines both your personal news along with the world news you are interested in. No doubt that there are better news apps than Paper in the app ecosystem like Flipbaord but then that is their area of expertise and it is not fair to compare it with them just now. Other than that, the best thing (at least for now) is that it is ad free and has a lot of white space around the content making sure that you are not disturbed while enjoying your content of interest. Paper is supporting a host of gestures like pinch to zoom and swipes and feels lively to use. There is no refresh button in the app but that's because it updates automatically and the content arrives fresh as soon as it is posted. There is not even a back button and you just need to down swipe to return to the previous view. 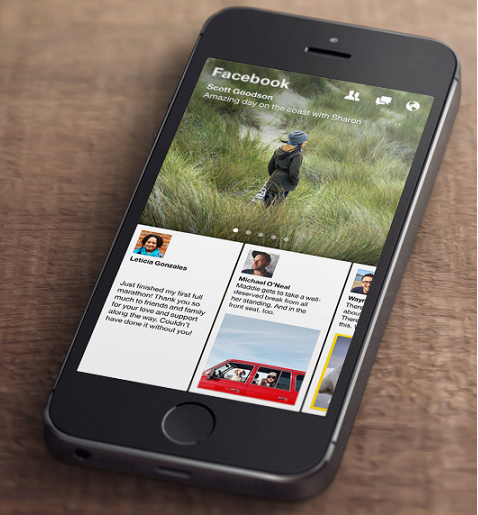 Paper offers a fresh and an highly advance alternative to the native Facebook app. With your Friend requests, Events, Groups, Timeline and Notifications all at one place you won't find a reason to reopen your Facebook app ever again. As for technical advancements we just talked about- the posts open like a broadsheet news paper, when you rearrange your cards the sidelined cards shiver like dried leaves atop your screen, when you reshare any post the words "Ankit shared this" appear one after other alphabet as if you are typing with a keyboard. After using Paper, when you close it the next step you would be doing is to uninstall the app with the big blue "F" word written on it. Creative Labs just might be the answer to the questions posed by Facebook investors that its members are drifting to other services. With its powers to have small teams to try out their ideas on a number of people running into billion, Creative Labs is just the right mix of innovation and experimentation that Facebook requires to keep alive in this rapidly changing ecosystem of social networking. Paper has been launched just for US users and that too only for iOS ecosystem right now. However, these is a simple way for you to try Paper is you have an iPhone or iPad. To do this you just need to set your location in iTunes to US. First of all disable your iTunes Match account. Go to Settings app > iTunes and Store option and here turn of iTunes Match. You can turn it On again later. Now click "Featured" > "Apple ID" (you need to scroll down a little) > "View Apple ID". After you click on View Apple ID on the pop you need to enter your password. After that you can see an option "Change Country or Region", here change your country to US. Now you will be able to install Paper on your iPhone or iPad. "Facebook has made an intelligent decision in accepting and adopting the thinking that a persons life is not limited to his/her friend's post. Reading the views of others, interacting with the whole world is a part that cannot be ignored in a social ecosystem.". Well said! Kudos to the author for a well-written review of Facebook's Paper app. Indeed, the first look of this Paper app doesn't seem to make us feel that it is a Facebook product. With this app, Facebook has shown inclination towards adopting new ways of attracting users to Facebook. It is no longer rigid in it's approach to innovate only in terms of sharing updates with friends and family. With the News app, Facebook proves that it is making serious attempts to come out of it's shell and increase interaction with the world.